Some of these I was familiar with and identified on sight, but three of the pieces I didn't know of and couldn't find on Google. 1. 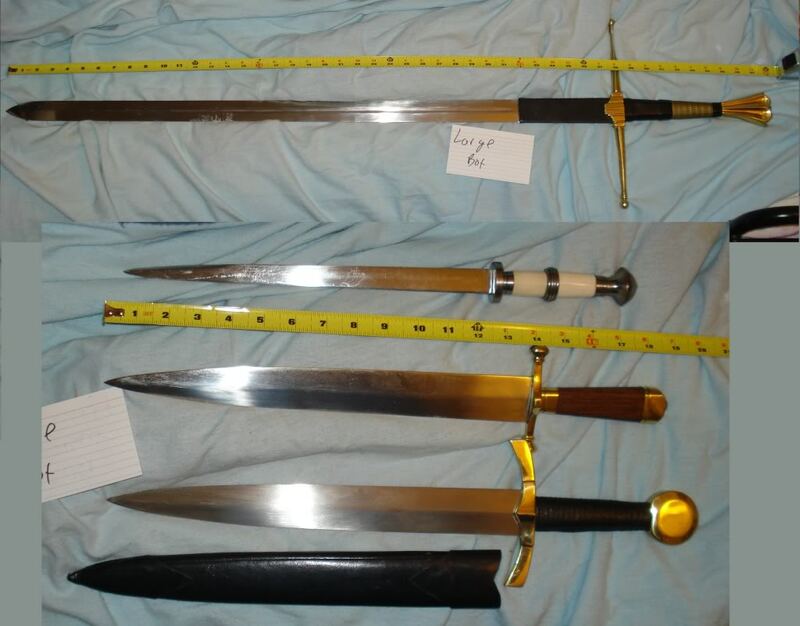 The sword on top is a "War Sword," which Mr. Brookhart told me was based on a piece from the London City Museum. I know I've seen either the original or the MRL/Windlass version before, but can't find it online anywhere. 2. The first dagger is a rondel of sorts that Brookhart said was copied from a piece in the Bashford Dean Collection. Couldn't find that either. Note: Please ignore the Arkansas Toothpick in the middle of the daggers. Windlass still makes that one and I knew what it was on sight. 3. The last dagger Brookhart described as "of a type," which was less than helpful. I suspect its furniture is made of brass, but I am away at college and when I had my father take these pictures for me we didn't discuss it. So, I would like two things here: The official MRL/Windlass name for each piece and pictures/info concerning the original piece they were based on, if applicable. Oh, and aside from his vague answers to my questions on the above and blurry pictures of the pieces, the transaction was smooth, easy, and cheap. If you see anything you want in Mr. Brookhart's little sale, go for it. It's no scam. Concerning the final piece in the pictures, I own one of these, but the scabbard on mine has a brass throat piece and chape. It is the "Brass Sword-Hilted Dagger" Item #401044. Perhaps this info would help in finding out more about it, but I am unaware of whether or not it was based on a specific historical dagger. My guess would be that it is simply based on the general type of dagger used during the period it is supposed to date to (the old MRL printed catalogs list this as "circa 1200". Thanks. Based on your info I was able to find it online. Unlike the other two, I rather doubt this "Brass Sword-Hilted Dagger" was based on anything historical, so I won't worry about that. I do like knowing what it's called though. I'm weird like that. If I may ask another question of you: The steel one's pommel is threaded. Do you know if the brass one is the same? I also have the bottom dagger. Mine has a threaded pommel (a fact I discovered when it came loose lol). I still have that aweful rondel dagger in storage. I think it was just called a Bone handled rondel. I bought mine some time in the late 1990s. The pommel unscrews and the whole thing falls apart, with very shoddy fit of all the grip pieces. I seem to remember that it was attributed to the late 14th century. Crap. I really liked the look of it. Still, the picture makes it look like the blade is more historical than most cheap rondels I've seen, so I'm not sorry. If it turns out to be shoddy I'll see about the use of epoxy to keep everything in one piece. You will need plenty of epoxy as the whole grip section is hollow. The blade is closer than some I have seen. Still hoping someone has knowledge of the original pieces for the War Sword and Bone Handled Rondel. And thanks Philip. Tod's Stuff does make good daggers, but although I'm sure they're well worth it, they are over $200 a piece. In this particular case the dagger was just $40 or $50, so I thought I'd chance it and see what it was like. I actually have two of those rondels myself, and I like them. I think the pommel is attractive and find the size and wieght in the hand nicely balanced.I have no idea how historical they are- but as a dagger, I like them. Mine have not fallen appart, but seems like a simple fix if they do. Resin epoxy should do the trick if needed. I have the original MRL catalogs around somewhere and will look for them this week. From memory, I think MRL advertised the rondel as their "French Rondel". I will find the catalog and give you the little write up they had in its listing. I will see if I can find the war sword, but its is not ringing any bells, depends on when it was made whether I have the catalog its in. I will take a look for that, but unlike the Rondel, I am not sure I have that one's listing.